The best premium decking plan understands your needs and wants; how elaborate or simple you want your deck to be, and how you plan to use it. 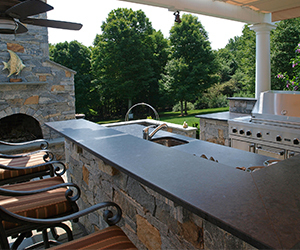 Take a look at existing premium decks for inspiration and ideas, then let the Geneva Deck Company design team help you visualize the perfect outdoor extension to your home. A custom designed deck adds real value to your home, and memories to share with family and friends for years to come. Do you strive for elegant solutions that quietly impress, or does your comfort zone defer to simplicity, function and reliability? Perhaps you want to make a statement, creating a design sensation with a deck plan that involves intricately shaped inlays, an awe-inspiring kitchen, a fire pit, and soothing hot tub. Whatever your preference, we can achieve your design goal. The design of your premium deck will depend upon the style and structural layout of your home, including such things as architectural style, shape of your home, number of levels, and even the color of your home. Geneva Deck will fully evaluate all elements to design a deck that enhances your existing structure with an inspiring outdoor experience. The variety of deck options is limited only by your imagination! Geneva Deck will partner with you to create and formulate design options and solutions for a deck that fits for your home and lifestyle. Our streamlined design and consultation process makes it easy for you to make decisions, and then you can relax while we transform your dreams into reality.